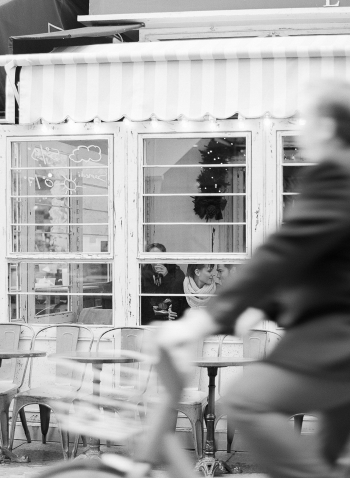 While I had been to Paris a few times before, I had yet to visit with my treasured film camera in tow. On my most recent trip to the area I was after just one thing, the very best view of the city. I longed to see the soft creme buildings with a distant Eiffel Tower rounding out my image on an overcast day. My wish was granted when a local friend took us to the top of the Printemps Department Store. On one side of the roof there was a view of the Eiffel Tower, while on the other there were endless white churches. It was everything one imagines Paris to look like from above. As an added bonus the infamous Ladurée store was situated inside the same building, selling their amazing macarons. Enjoying a salted butter macaron with a stunning view of the city was magical. Somehow, being far above the city with an incredible view took away all the feelings of being a tourist and brought a nice calmness to such a busy place. Rue Cler, where we made our home for the week, has absolutely amazing food. 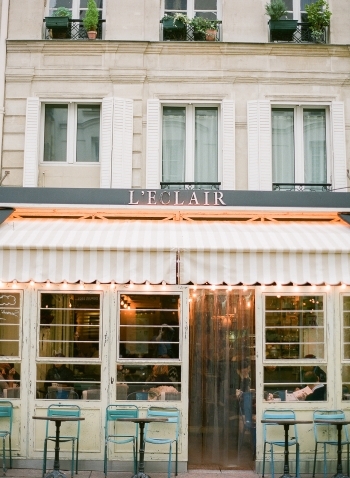 In the mornings, L’Eclair is a great little coffee shop to get an espresso and a croissant. Later in the day Tribeca is a restaurant right near the Hotel Grand Leveque with a fabulous menu. We found the chicken, veal and pizzas were all sensational. For a less expensive late night meal, the Bedford Diner on Champ de Mars is right around the corner from Rue Cler and is a great little burger place that pays homage to its Brooklyn roots. After dinner, the homemade ice cream at Amarino is always a favorite. 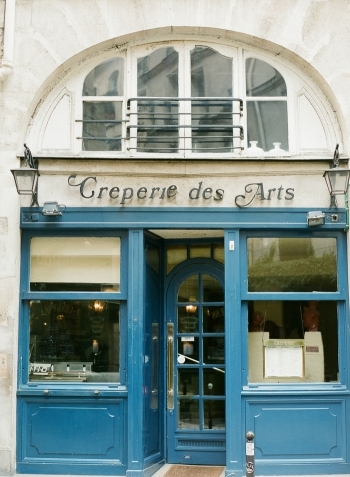 While in Paris we stayed in a small hotel on the lively and beautiful Rue Cler. During the day the street was full of small shops selling fruit and vegetables, cheese and wine. The street is most famous for their market, but at night the restaurants come alive. 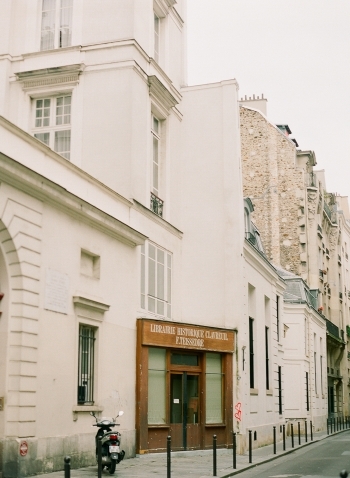 This street has received a fair bit of press for being the most authentic version of Paris. Having read reviews claiming the opposite, I was delighted to find that everyone we encountered during our visit was a local. Hotel Grand Leveque has beautifully renovated rooms with views of the Eiffel Tower. We enjoyed sitting on the patio at night with a bottle of wine, watching the tower twinkle on the hour. Autumn was the perfect time to travel to Paris and we found ourselves needing only a light coat to keep us warm. 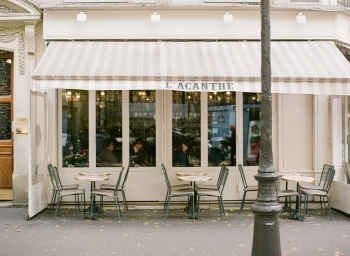 While Paris is always busy and bustling, I came to realize that the fall has a nice pace to things. The temperature also makes Autumn a great season to explore all the famous spots on foot, as opposed to car or train. Looking back I found Paris to be magical and I wouldn’t change a thing about our trip. For the best view of the city, head to the top of Printemps Department Store and grab a macaron at Ladurée while you’re at it. 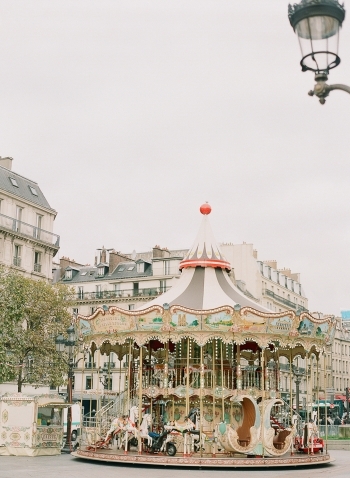 Spend an afternoon walking the markets of Rue Cler. 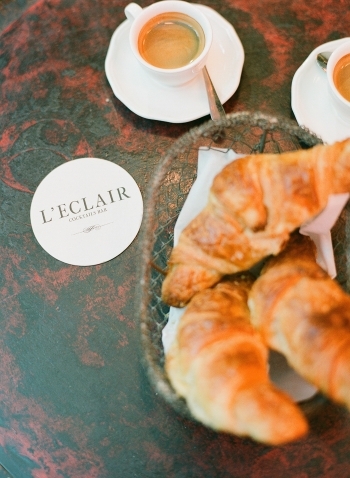 For espresso and a croissant, stop by L’Eclair. Brittany Mahood is a wedding and lifestyle fine art film photographer, with a serious case of wanderlust, who splits her time between Winnipeg, Canada and Phoenix, Arizona. She has been featured on Grey Likes Weddings, 100 Layer Cake, Once Wed, and The Refinery Magazine, among others.